ActiveX which allows you to convert video files between AVI, MPEG1, MPEG2, VCD, SVCD, VOB, WMV, and ASF formats. Supports different AVI video Codec. NTSC/PAL setting. Change video size, frame rate, and bit rate.Adjusting Variable Bit Rate (VBR). Support all Video/Audio codecs installed on your system.Select between WMV profiles or WMV custom profile. Support Windows Vista. Free update for Lifetime. ...... VOB, WMV, and ASF. 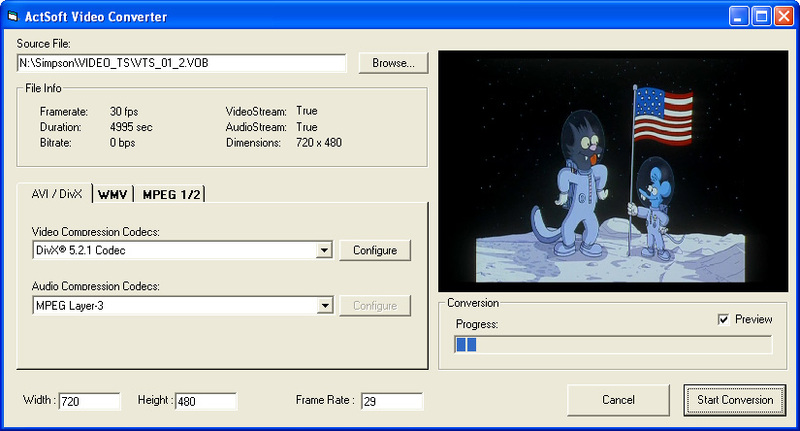 *Adjusting Variable Bit Rate (VBR) in MPEG files. *Support all Video/Audio codecs installed on your system and access the configuration dialogs (e.g. MPEG4, DivX, XviD, WMV). *Select between WMV profiles or WMV custom profile. *Preview video file during conversion. *Support Windows Vista.Free update for Lifetime. AVI, MEPG1, MPEG2, VCD, SVCD, VOB, WMV, and ASF. Qweas is providing links to ActSoft Video Converter ActiveX 3.2 as a courtesy, and makes no representations regarding ActSoft Video Converter ActiveX or any other applications or any information related thereto. Any questions, complaints or claims regarding this application ActSoft Video Converter ActiveX 3.2 must be directed to the appropriate software vendor. You may click the publisher link of ActSoft Video Converter ActiveX on the top of this page to get more details about the vendor.